North Korea has replaced its hard-line armed forces minister with a relatively unknown general, according to state-run news agency KCNA. Little is known about Jang Jong-nam, who replaces General Kim Kyok-sik. Officials in Seoul say his political stance is not known, but he appears to be younger than his predecessor. Meanwhile, Pyongyang has denounced new joint US-South Korea naval drills that involve a US nuclear-powered aircraft carrier. KCNA introduced Mr Jang as "Minister of the People's Armed Forces" in a report about attendance at an art performance on Sunday. Mr Jang, believed to be in his fifties, was reportedly commander of the First Corps of the Korean People's Army before assuming this role. He replaces General Kim Kyok-sik, who was said to be responsible for the shelling of South Korea's border island Yeonpyeong in 2010, which killed four South Koreans. Officials in Seoul said they were aware of the personnel change, but would "need more time to figure out the overall direction" and whether the change was significant. "We do not know if [Jang] is a less hawkish figure, but it appears that he is from a younger generation," South Korean defence ministry spokesman Kim Min-seok said. "Just because there is a new dot that does not mean that a whole line or landscape changes," he added. 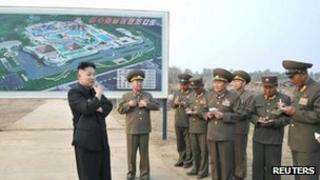 Analysts believe the move may be part of Kim Jong-un's efforts to consolidate his influence over the military. Another high-profile military move took place in July 2012, when North Korea's military chief, Chief of General Staff Ri Yong-ho, was removed. He was replaced by Hyon Yong-chol, who is also relatively unknown. Both the Chief of General Staff and the Defence Minister are subordinate to the National Defense Commission, which is chaired by Kim Jong-un. The reshuffle comes after a period of heightened tensions on the Korean peninsula. North Korea had been angered by tightened UN sanctions following its third nuclear test in February, and joint US-South Korea military drills earlier this year. Meanwhile, North Korea has denounced a US-South Korea naval drill involving the USS Nimitz, a US nuclear-powered warship, as "a fresh tinderbox to escalate the tension". The US navy said the two-day operation was intended to "reinforce regional security and stability".